I thought that it would only be fair to introduce you to one hero who survived such an attack. Got these from a friend. You won’t see these kind of things on CNN or in a “Claire” commercial. These are photos of a sniper victim soldier getting good care and taking his first steps. Please keep this patriot in your thoughts and prayers! With permission from the McClellan family I am reprinting the story here of this young Missouri hero. Lance Cpl. John McClellan returns home. The ambulance is on the runway ready to transport Lance Cpl. 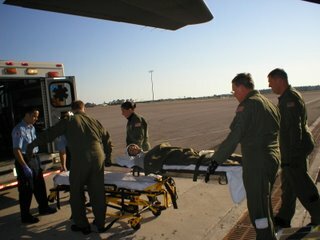 John McClellan to the hospital in Florida. The third time he was shot was the luckiest day of Lance Cpl. John McClellan’s life. A sniper’s bullet somehow flew barely under the Marine’s helmet, hitting just above his left ear. It severed facial nerves and parts of his ear, ripped a hole in the lower section of his skull and brain, and tore its way out through the back of his neck. But it missed his carotid artery by the thickness of a few sheets of paper. And it missed vital sections of his brain. It missed his vision and vocal controls, too. And it didn’t kill him. C130-5 Taking John off the plane. McClellan is recovering at a rehabilitation center in Florida, and his family is thanking God and the military medical system for his survival. Doctors told his family that 99 of 100 patients with similar injuries die. But he was the other one. 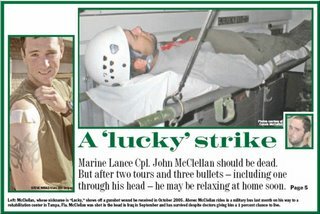 The irony is that the 20-year-old McClellan was known as “Lucky” by his fellow Marines even before his latest miracle. 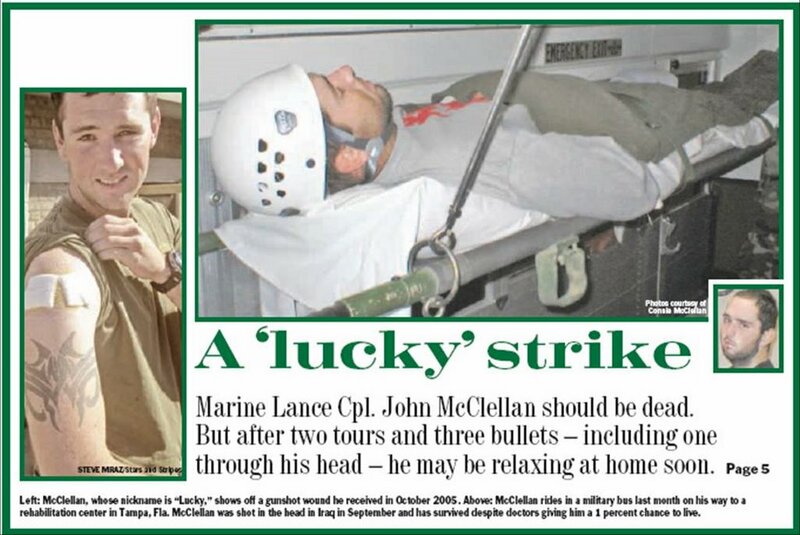 In October 2005, Stars and Stripes ran a story about how members of Company E’s combined anti-armor team, 2nd Battalion, 3rd Marine Regiment, 3rd Marine Division had been teasing McClellan for getting shot twice in one week during patrols in Afghanistan. Those two hits were both in his right arm, one near the wrist and the other by the shoulder. Both were superficial, and earned him the nickname of “bullet sponge” from his relieved teammates. McClellan finished that tour of duty in Afghanistan without any more close calls. 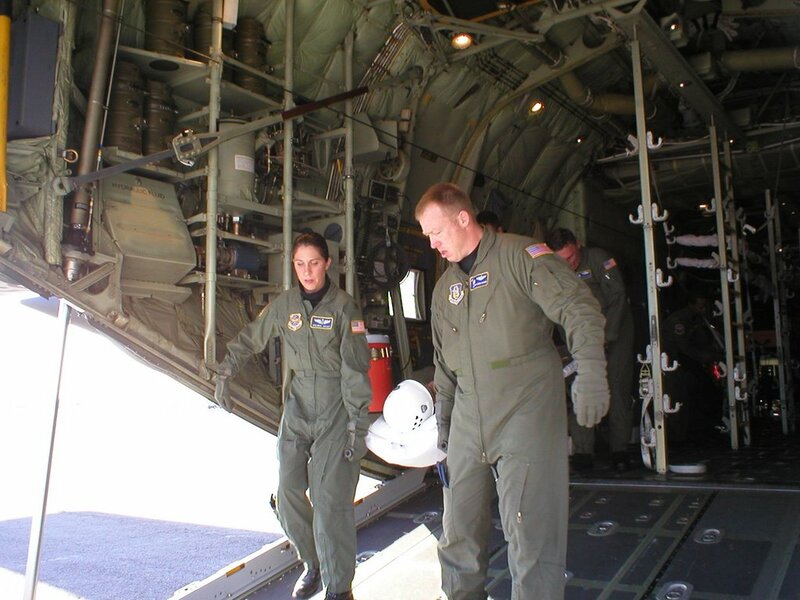 He returned home, then redeployed to Iraq this September. 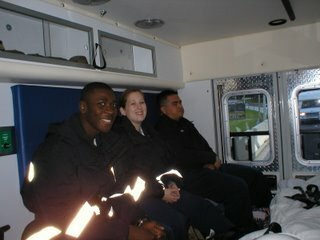 John, “Lucky”, is moved into the ambulance in Tampa. He had been in Haditha for less than a month when that third time came. The Marines told him an unlucky shot from a hidden sniper took him down. As corpsmen rushed to McClellan’s aid, his teammates delivered a fatal volley to that shooter. In those missing three days, McClellan was sped from the tower triage to an field hospital, then to Germany and back to the National Naval Medical Center in Maryland. He has gotten a chance to thank a few of the doctors who worked on him, but most of them never saw him conscious. His mother, Connie, said doctors initially told her he’d be lucky to live. When he survived, they said he’d be lucky to avoid major brain damage. When his brain functions stabilized, they said his hearing and vision might be beyond repair. 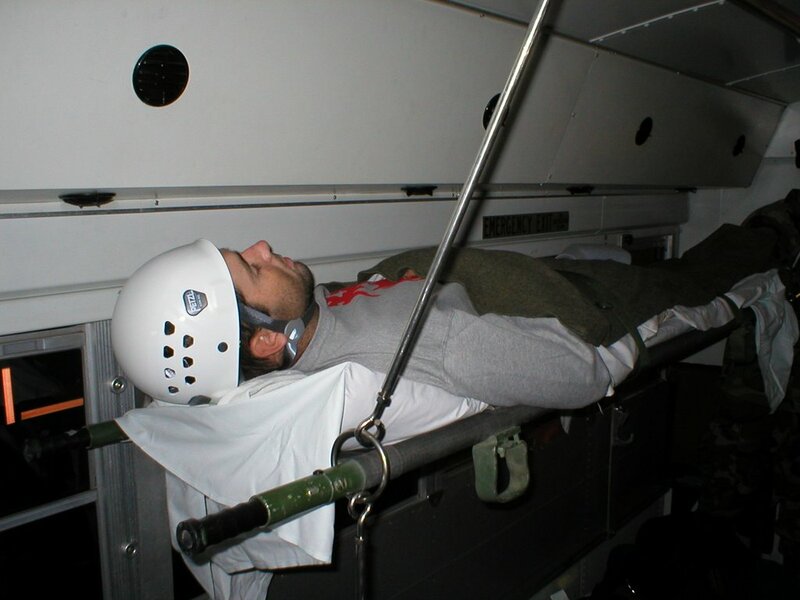 The ambulance nurses from Bethesda to Tampa, Florida. McClellan still has to regain strength in nearly all of his muscles and may need to have a nerve transplant to regain motion in the left side of his face. He expects he’ll have to finish his military career in a desk job if he isn’t medically retired. Either way he faces months of recovery, but that’s going so well so far that two weeks ago doctors moved him down to Florida to begin his rehab work, and therapists there think he’ll be able to go home to Columbia, Mo., by Thanksgiving. When that happens he’ll be able to show off his third Purple Heart, too, presented to him before he left Bethesda. His mother has been carrying around the first two since he was hurt. 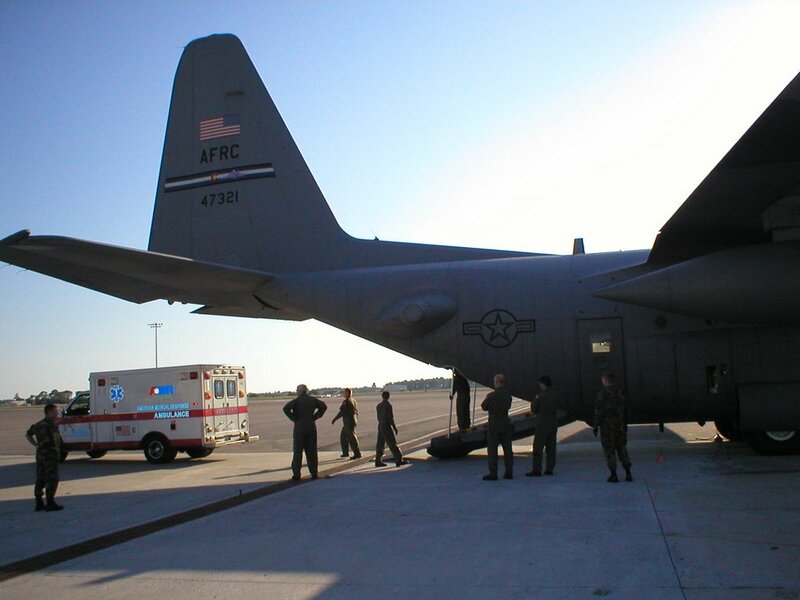 The ambulance from Bethesda to Tampa, Florida where John is recuperating. Another Marine mother, Nilda Anes of McAllen, Texas, contacted the McClellans on Tuesday by phone to deliver a message from her son, Cpl. Mario Anes, who was next to McClellan when he was hit. Yesterday, John walked 380 steps in his walker. The day before was 300; before that 200; before that 150; before that 80. EVERY day he’s gaining more strength and more balance. Yesterday he was able to stand without assistance, and without losing his balance for over 10 seconds. That doesn’t sound like much to us, but trust me………………..that is HUUUUUUUUUUUGE!! We are THRILLED with the progress. He is truly having to learn to walk again, but he’s doing great. Also, he has GAINED 10 lb’s just in the past week! Lord, in the name of Jesus, we thank you so much for what you are doing in John. We thank you also , Lord, that he will not need a wheelchair when he comes home on the 21st of November, and that the walker will just be for safety. We thank you, Lord, that his body builds strength and muscle each day to easily support his 6’2″ frame without ANY trouble. We thank you, Lord, that while John’s head is vulnerable because of the missing skull cap in the back of his head, that you will keep him safe and will not allow him to fall. And, in the meantime, Lord, we thank you that you continue to watch over his buds in Haditha. We ask this in the precious name of Jesus, Amen. Dr. Rusty Shackleford at The Jawa Report has background on the Iraqi snipers. CNN’s Disgusting Stunt May Find Them Banned Like Aljazeera! Blitzer: We Show Snuff Films But Don’t Question Our Patriotism! Godspeed Lance Cpl. John McClellan!